A two-tone finish adds inviting cottage style to this slat back side chair for a breakfast nook to your primary dining room. The cottage white paint finish complements the burnished brown finish of the comfortable scooped seat. Made with select birch veneers and hardwood solids, this chair adds practical seating with plenty of charm. The Whitesburg Dining Room Side Chair w/ Two-Tone Finish & Slat Back by Signature Design by Ashley at Sparks HomeStore & Home Furnishings Direct in the Thatcher, Cottonwood, Safford, Sedona, Morenci, Arizona area. Product availability may vary. Contact us for the most current availability on this product. 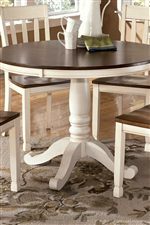 The cottage style of the Whitesburg dining collection is just the thing you need to create an inviting space for meals and more with family and friends. The two-tone finish of the pieces combines a burnished brown finish with cottage white paint finish. Made of select birch veneers and hardwood solids, you will have a great set for your home with your choice of table and chairs. The Whitesburg collection is a great option if you are looking for Cottage furniture in the Thatcher, Cottonwood, Safford, Sedona, Morenci, Arizona area. Browse other items in the Whitesburg collection from Sparks HomeStore & Home Furnishings Direct in the Thatcher, Cottonwood, Safford, Sedona, Morenci, Arizona area.